I just found out that I'm on the guest list for a party in Chicago next month that's taking place during the Kitchen and Bath Industry Show. 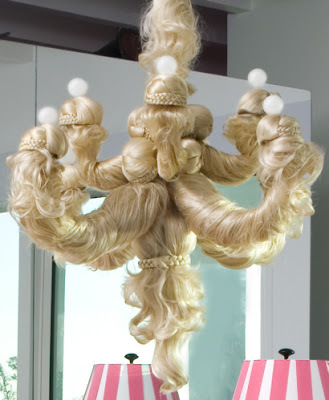 While I'm there, I'll be granted an audience with the man who brought the world a Barbie hair chandelier. That's right, it's me and Jonathan Adler baby. The only thing that could make it better would be if Maxwell Gillingham-Ryan and Oliver Ryan, the founders of Apartment Therapy, were there too. I can't get over ppl gushing about that boobie lamp.. UGH. Decor created based on disembodied female bits creep me the hell out.. so very Silence of the Lambs.. This will be a character builder for sure. I think the mans's a cartoon and considering the amount of space I devote to mocking his creations, I HAVE to get a photo with him. I want an autographed copy of that! "Waiter, there's a hair in my soup!" 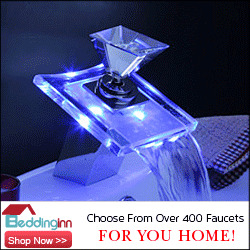 "Ah, yes, sir, that is the essence of one of our exquisite examples of Jonathan Adler's work. You can see it there, above your head." "Oh my God! It looks like Cousin It's daughter!" "I assure you, sir, this is the creation of a gifted artist. It is considered by the commonfolk to be a sign of "luck" if one is to be graced by a golden strand from the body of the work." "Can I have another bowl of soup, please?" Nim: It's killing me just to think about it. I have been giggling like an inpatient all day. Bravewolf: Hilarious and sadly true. By the way, can you e-mail me your new URL? I want to add it to my reader. Thanks! Oh to be a fly on the wall. Believe me, I plan to document the whole thing. Paul and PeeWee, together at last. He does remind me of Paul Reubens! It wouldn't surprise me. Either a giraffe or a vase shaped like breasts. That light fixture reminds me of Zsa Zsa Gabor where she might say "Dahhhling I love your hair color". Johnathan looks like the nerdy brother on Two and a Half Men... don't you think? Current TV shows are a gaping hole in my knowledge base. I have never seen that show, but I'll give you the benefit of the doubt. Now Zsa Zsa I get comepletely, I always refer to Barbara Barry's sensibilities as the Lisa Douglas look. I know Adler's being clever with the wig chandelier but it still gets on my nerves. I have three Adler Vases I bought on e-bay a million years ago before I knew who Adler was. I love them for their cool geometric designs. When someone mused, "oh you collect Jonathon Adler?" All I could say was, "Jonathon Who?" His vases are allowed in my home, just not that chandelier. I loved his striped vases from when he was a humble potter so I know the ones you're describing. Something happened since then though. It's hard out here for a pimp Kevin.